For a perfect sphere it is quite easy to determine the particle size: You only need the diameter. If all particles were spherical it would be quite easy to determine the particle size using the available methods. Unfortunately molecular systems very seldomly form nice spherical particles. Instead they form various other shapes – and all particles in a mixture have different particle size. Below you see a SEM picture of a pharmaceutical compound. If you were to describe the particle sizes in this mixture – how would you do it? Would you describe all the particles separately? And would you report the length or the height? From looking at the picture it is quite clear that it is not a simple task to describe the particle size/particle size distribution. Microscopy: Easy method to get a fast view of the particle sizes. Information about shape. Very difficult/time consuming to get a statistically suitable description of the particle sizes. A very useful method in verification of laser diffraction results. 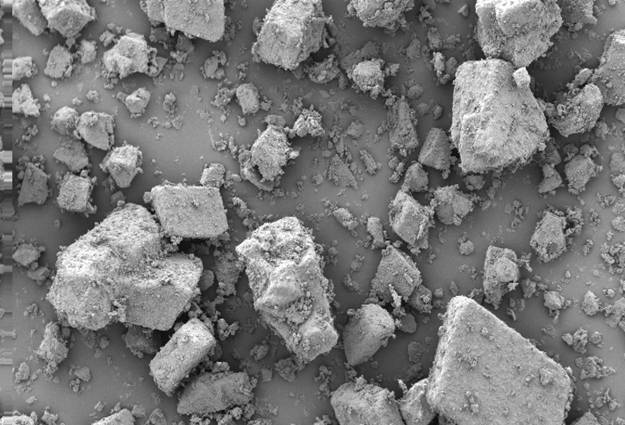 SEM: Same advantages as from microscopy with regard to particle size – including 3D information. Detailed information about morphology. Do the particles aggregate or do they exist as single particles? As for microscopy it is not possible to get a statistically suitable description of the particle sizes. A very useful method in verification of laser diffraction results. Laser diffraction: A robust method for obtaining a full overview of the particle sizes, as a large number of particles are analysed. However, a validated method is needed in order to secure that the laser diffraction results are translated correctly into particle sizes. BET: A method for determination of surface area. No detailed information about particle shape. Very well suited for porous or lamellar materials, as you hereby obtain information about structure. The method is less suitable to distinguish between particles sizes of non-porous particles. Sieving analysis: Equipment is very cheap and useful if you want to search for single large particles in your mixture. Requires a large sample amount and is quite time consuming. Almost no information about “fines” can be derived. Please contact us for recommendations about the best suited method(s) for your product.